WASHINGTON — Harris CapRock Chief Financial Officer Paul Rainey has left the company to join the executive team of satellite connectivity provider Global Eagle Entertainment. Rainey fills the void left by Global Eagle’s previous CFO, Tom Severson, who stepped down from the company in February, concurrently with the departure of Chief Executive Dave Davis. In an April 10 statement, Global Eagle said Rainey started his new CFO position on April 3, taking up responsibilities that CEO Jeff Leddy had been performing on an interim basis. Rainey’s arrival comes as the company faces a near-term threat to its status on the Nasdaq stock exchange. 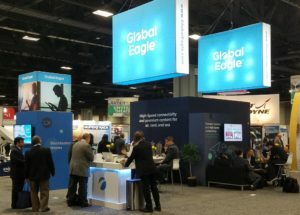 Global Eagle received a warning from Nasdaq in March that it must submit its overdue 2016 financial results by May 19 or risk initiating the process of being delisted for noncompliance with the exchange’s listing rules. Before a three-year stint at Harris CapRock, which SpeedCast purchased in November 2016 for $425 million, Rainey was CFO of General Electric’s Lighting Professional Solutions business from March 2013 to April 2014 and of its Power Equipment business from March 2010 to February 2013, each of which generated roughly $1 billion in annual revenue. In an April 7 filing with the Securities and Exchange Commission, Global Eagle said Rainey will start with an initial annual base salary of $375,000, plus equity in the company collectively worth up to $850,000. Global Eagle said its stockholders must approve a new equity incentive plan to ensure he gets the equity, which is split into two stock amounts worth $350,000 and another worth $100,000. Rainey is also eligible for an annual performance bonus that starts with an initial target of 75 percent of his annual base salary.